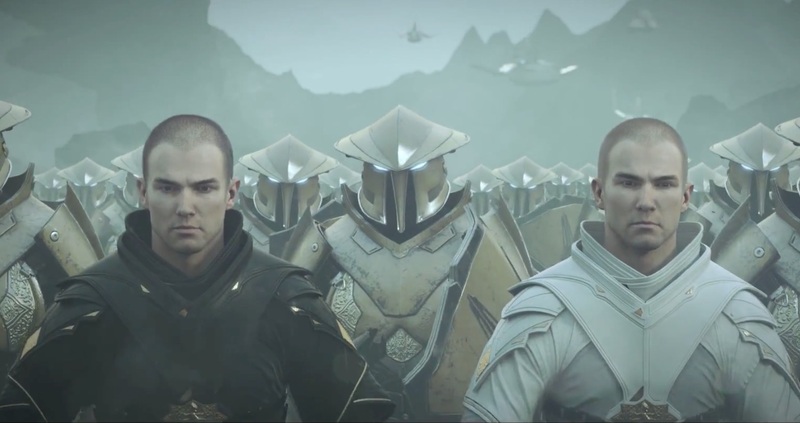 As you undoubtedly already know, Star Wars: The Old Republic is putting out a new expansion soon, Knights of the Fallen Empire. Normally this wouldn’t be huge news to those who aren’t die-hard fans of the game — SW:TOR has been cranking out expansions at a decent clip for a while now — but this one seems different. I respect the steady pace of new expansions SW:TOR has managed, but part of their speed is due to their relatively small scale. Granted, I don’t play the game, but everything I’ve heard says that these expansions are really quite small, usually offering just one new feature or a handful of new zones (or such is my impression). Knights of the Fallen Empire seems different. Bioware has found their ambition again, and while details on the exact content of the expansion are still scarce, it sounds like a massive shake-up to the game. Add to that a spectacular full cinematic trailer, and the hype train has left the station. 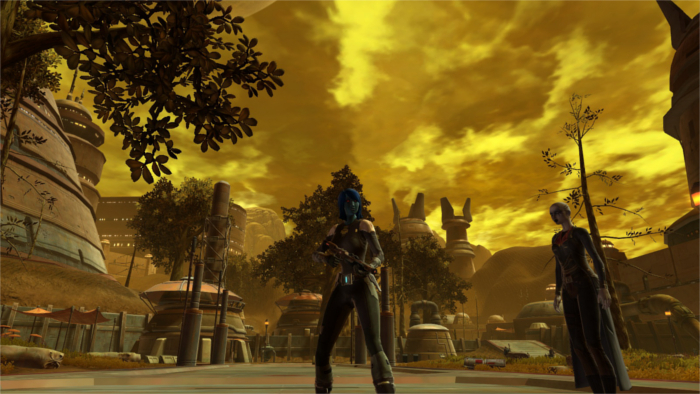 All this chatter has me considering something that until now had been unthinkable: Actually playing SW:TOR. Let’s start with why I’m not playing SW:TOR right now. Long-time readers of this blog will be familiar with my thoughts, but it’s been a while, so I’ll provide a refresher. 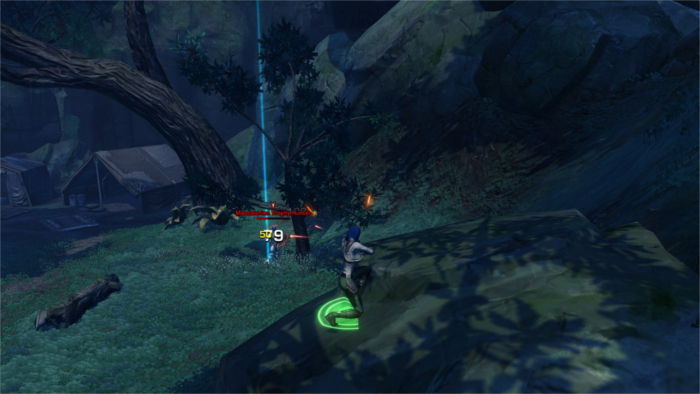 I don’t think SW:TOR is, at its core, a bad game. The mechanics are solid, if often uncreative, and it plays fine. Its most fundamental flaw is the God-awful graphics that make it look like Mr. Bumpy: The MMO. That said, it’s not an especially memorable game, either. It suffers from the same problem so many MMOs had for so long: It’s basically WoW with a fresh coat of paint and one or two unique selling features. In this case, the unique selling point was its commitment to story. The class stories were very high quality — as one would expect from Bioware — but copious voice acting wasn’t enough to make all the pointless “kill ten rats” side quests interesting. Personally, I also quite liked the class design. 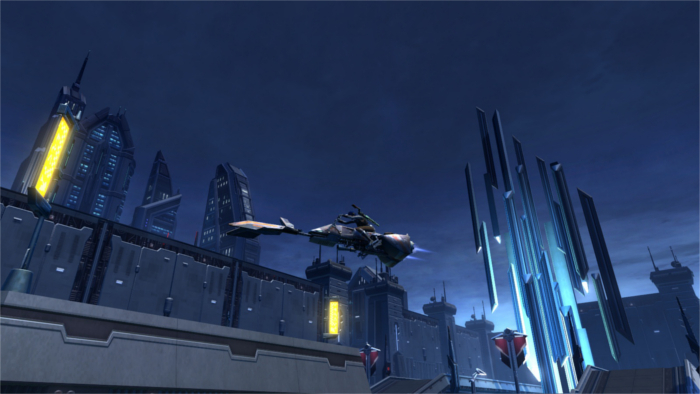 The Imperial agent had a great combination of shooter and traditional MMO mechanics, and I swear I heard the Duel of the Fates start playing in my head during some fights on my Jedi. But I didn’t find those things were enough to stop SW:TOR from feeling generic. As I’ve said before, when I want to play WoW, I’ll play WoW, and games that too closely ape its mechanics feel very tiresome to me. And then there’s its oft-criticized free-to-play model. It’s some horrible Frankenstein creation where you still have to subscribe to enjoy the game properly, but the free option doesn’t even work as a trial because it makes the game so utterly miserable. And then there’s my general ambivalence toward the Star Wars universe. Like most little boys, I loved Star Wars when I was a kid, but I outgrew it. Seen through an adult’s eyes, the movies are ridiculous cheesefests that are impossible to take seriously — yes, that includes the original trilogy; come at me, bro. However, I do think it’s a great concept with enormous potential, and I’ve always felt the franchise could be magnificent if it was ever given over to someone who actually knew good-storytelling and cared about more than selling toys. I do not think JJ Abrams is that person. This brings us to Knights of the Fallen Empire. The thing being trumpeted from the rooftops about Knights is that it’s a return to Bioware’s roots, focusing on story above all other considerations. 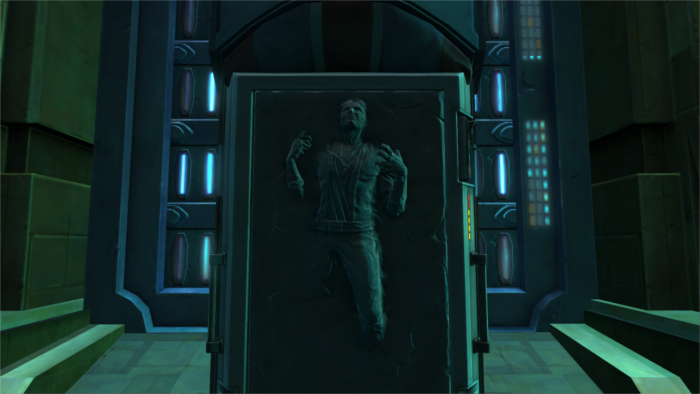 The meat of the expansion is a storyline making the player the hero of the galaxy in the face of a terrible new threat to Jedi and Sith alike, almost a new single-player RPG within the MMO. In fact, players will be literally unable to interact with their fellows through much of the storyline. It’s hard not to see this as a tacit admission by Bioware that they should have stuck with what they do best — single-player RPGs. It does seem an attempt to excise the MMO from the RPG, and while I certainly sympathize with those who are upset by this, I think it’s a wise move. 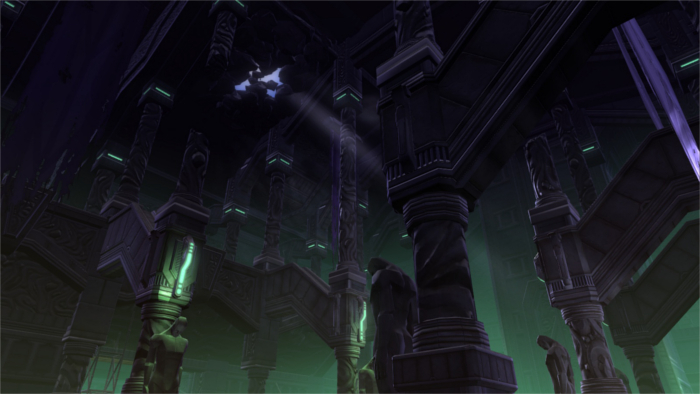 The consensus has long been that SW:TOR’s strength is its story and its weakness is all the parts where it tries to be an MMO, and my admittedly limited experience with the game aligns with this perception. It’s not just the new content that’s different, though, and here’s where it gets really interesting. Bioware is also planning to revamp the entire game from top to bottom to focus on story-telling. Unfortunately, the details on this are incredibly vague, and that does make me a bit suspicious. It could be as simple as retuning XP rewards so you can ignore side-quests. It sounds like more, though. There’s a lot of talk of changing the game from the ground up to cut down on time wasted on travel and other pointless distractions — something the game badly needs. One thing they have announced for sure is that leveling flashpoints (dungeons) will have the option to be played solo for the story, which is fantastic. Dungeons were one of the most obvious places in which Bioware’s attempts to marry single-player story to MMO mechanics fell flat on their face. You get outvoted, and your character ends up making a conversation choice you vehemently didn’t want while some bozo is constantly pestering everyone to just skip the cutscenes already. All this talk of story first and solo-friendliness is music to my ears. I’ve always been someone who likes a little MMO in their RPG instead of a little RPG in their MMO, and it definitely does play to Bioware’s strengths. They’re good at story, and not much else. It also seems like perhaps the best chance I’ll ever have to experience Star Wars as the smart and powerful story it should be but isn’t. But I do wonder how much they can really change about the core game, and then there’s still that wretched business model to consider. You know what holds me back more than anything else? Emotes. In SW:TOR, many emotes are locked out to non-subscribers, and there’s no way to unlock them other than subbing. I’m not talking about fancy, extra emotes — just standard stuff like /salute. I’m not much of a role-player, and I don’t even use emotes that much, but it just seems like such a petty and asinine thing to do that it sours the whole game for me. I can live with greed, but that crosses the line from greed to spite. Now, Knights is in some ways improving the business model. The expansion will have no box price. If you subscribe, you get access to it. Better yet, you’ll also get access to all past expansions, and you won’t lose access to any of that content even if your sub lapses. All the other bad stuff about the business still applies, but that’s something. I have always felt that games should charge a box price or a sub price, but not both, so while SW:TOR has probably the worst F2P model, come Knights it will ironically have one of the best sub models. I don’t like subscriptions, but I wouldn’t mind subscribing for the first few months while the new game smell is still strong. What happens after that worries me, though. I’m not willing to sub to any game indefinitely, least of all SW:TOR, and the free option is still a horror show. In case it isn’t clear by now, I’m very much on the fence. On top of everything else, there is a huge glut of games I want to play right now, and with most of my time spent on looking for apartments lately, that backlog is only growing. On top of all the other things holding me back, Knights of the Fallen Empire has a lot of competition. But still. The temptation won’t go away. This entry was posted in Games and tagged sci-fi, Star Wars by Tyler F.M. Edwards. Bookmark the permalink. As someone who played SW:TOR solidly for nearly a year, then completely lost interest after it went F2P, I am intrigued by this. Definitely need to keep tabs on its progress. I am guessing EA/Bioware is looking at the success of games like The Witcher 3 and their own Dragon Age:Inquisition, compared to the relative crappiness of MMOs, and realizing it’s a no-brainier on how to proceed with TOR.